Acer embrace - view 2 Hey everyone who is pinning this image on Pinterest - this is not a modgepodge of glued up leaves. Please get your information correct. Thanks. Probably the most challenging piece I've ever done. Carving the interior space was a pain in the ***, not to mention my hand - especially after my finger surgery. 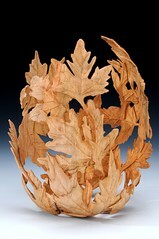 I entered this for consideration for the Maple Medley exhibit. The wording on the entry form was a bit worrying to me because it seemed as if they were looking for mostly turned forms, but we'll see what happens. This started out as a hollow form 10 X 7.5 inches with 1.5 inch walls.